I have been getting a huge number of hits today from Greg Sargent's old blog post about the genesis of the term "the Village" which I eventually traced to this post today by John Aravosis, who hadn't heard the term and didn't know where it came from. I have explained this before but I think it's worth repeating once in a while since the term is actually fairly common in the blogosphere. Greg is right that it stems from the notorious Sally Quinn article about the Clintons. But it's more than that. It's shorthand for the permanent DC ruling class who have managed to convince themselves that they are simple, puritanical, bourgeois burghers and farmers, even though they are actually celebrity millionaires influencing the most powerful government on earth. It's about their phoniness, their pretense of speaking for "average Americans" when it's clear they haven't the vaguest clue even about the average Americans who work in their local Starbucks or drive their cabs. (Think Tim Russert, good old boy from Buffalo, lately of Nantucket. )It's about their intolerable sanctimony and hypocritical provincialism, pretending to be shocked about things they all do, creating social rules for others which they themselves ignore. Part of the grounds near the Trianon were chosen by Marie-Antoinette as the site of a lakeside village, a crucial feature of picturesque landscape gardens then so fashionable among Europe's aristocracy. 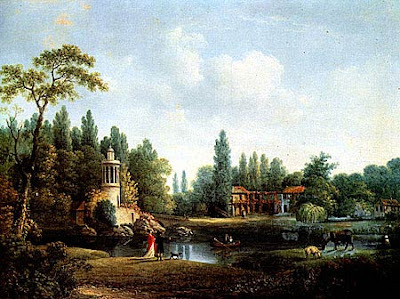 In 1783, Richard Mique built this amusement village where the queen played at being a shepherdess. In 1784, Marie-Antoinette had a farm built, where she installed a farming couple from the Touraine region, along with their two children. They were charged with supplying the queen with eggs, butter, cream and cheese, for which they disposed of cows, goats, farmyard animals. Everything you say about the term is true, but I also feel it is appropriate to add one additional association: Kafka's "Das Schloss." There is "The Village" and there is "The Castle." The Villagers are supposedly people just like the narrator, but he can never seem to understand them, and they block his access to the Castle and its inhabitants. They are not IN the administration, but they are its minions, almost unconsciously.